LG Electronics will start developing autonomous driving modules for robots with its partner Robotis, expanding applications of robotic technologies and self-driving solutions, the company said Monday. The two firms signed a contract Friday to co-develop autonomous driving modules that will be mainly used for moving robots. LG’s Advanced Robotics Lab under the CTO division plans to develop software using its intelligence navigation technologies, while Robotis will be responsible for building hardware for autonomously moving robots, such as actuators and motor controllers, the companies said. LG and Robotis formed ties in December last year as the tech titan bought a 10.12 percent stake in the specialized robot maker that was established in 1999. Robotis is a leading manufacturer of actuators that serve as the joints of robots’ bodies and help expand the scope of robots’ movements and activities. The primary goal of the latest partnership for LG is to strengthen its robot business portfolio by adding a self-driving robot to the current eight types of robots under the brand CLOi. The CLOi lineup includes a home bot, guide bot, clean bot, lawn bot, serve bot, porter bot, cart bot and suit bot. “By constantly collaborating with Robotis with nearly 20 years of experience in the robot development field, LG will continue expanding our robot business portfolio,” said Ryu Hye-jung, senior vice president at LG’s home appliances business. 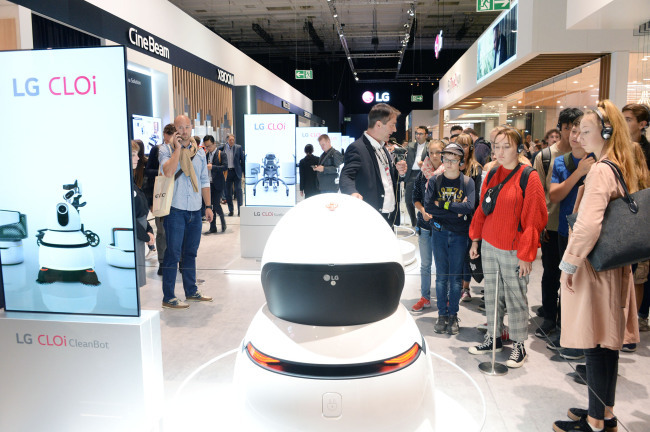 LG is betting on robotics and artificial intelligence as its main growth businesses for the future, with a goal of making profits with robots in three years as announced by its CEO Jo Seong-jin in January. “Synergy between home appliance products and robots will be maximized with the collaboration with LG,” said Robotis CEO Kim Byoung-soo.